But technology has also made business and life, in general, more complex. “There’s an app for that” is commonplace nowadays, and in reality, it’s more like “There are a hundred apps for that.” But with so many different types of software, we start to get lost in multisystem chaos. You’re probably experiencing multisystem chaos right now, right? You’ve got too much software to keep track of or you simply don’t know what to get because you’re too overwhelmed by all the choices. If you’re like most marketers, you have a bunch of overlap and segmented systems that aren’t interacting together. It’s happening because the availability of marketing software is moving so rapidly that it’s tough to keep up. The following diagram demonstrates the chaos we are experiencing. 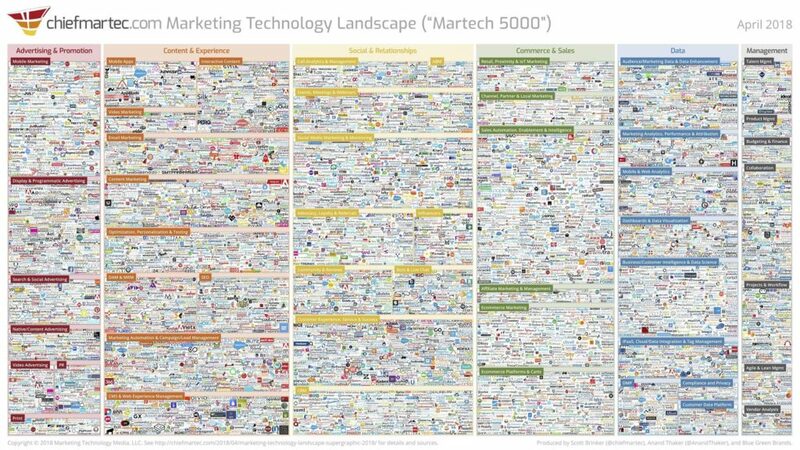 It shows 5,000 marketing technologies that are available as of April 2018. That’s a lot of software! Each day, more and more software and technologies are added. Who knows, that chart might be up to 5,500 if it were created today (just 3 months later). Companies should purchase tools because they work together and meet the objective of your business plan and intended customer experience, not just because someone says it’s a “must-have” software. That’s where the importance of a marketing technology stack comes in. Without a marketing tech stack, it’s pretty difficult to succeed in the multisystem chaos of the modern business world. A marketing technology stack is a group of technologies that help marketers improve their marketing efforts, bring more ease into the process, measure the effectiveness of their marketing campaigns, and increase conversions. Advertising – This could include getting traffic to your website, mobile marketing, social advertising, content advertising, video advertising, print, and PR. Content & Everything Related To It – Content is king and it needs to integrate with sales and customer service. This type of stack can include content marketing, email marketing, SEO, marketing automation, content management systems, data asset management, content management systems, mobile apps, video marketing, and optimization. Relationship & Social Marketing – This stack covers everything that involves nurturing leads and building relationships. You’ll want to look at social media, customer relationship management (CRM) software, account based management (ABM), referrals, loyalty rewards, call analytics, email marketing, webinars, events, customer feedback, and experience. Sales & Shopping – This category involves everything that plays a role in your customer’s shopping experience. Seamless integration across a complex shopping experience that involves multiple channels and devices is key. Here, you’ll want to look at e-commerce marketing platforms, affiliate marketing, sales automation, retail marketing, and sales partnerships. Data – We have an abundance of data in general and sometimes it’s important to look at that aspect on its own. The systems you’ll want to look at might include marketing analytics, web analytics, customer intelligence, predictive analytics, customer data management platforms, etc. Workflow & Internal Management – This will vary drastically from company to company, but it could include things like product management, projects and workflows, collaboration software, budgeting, employee management, etc. What Are the Benefits of a Marketing Technology Stack? As we pointed out in a previous article, so much of the technology we buy these days isn’t even used. We purchase (or more often, subscribe to) a certain piece of software to accomplish a task, and we are either unaware of everything else the software can do or too overwhelmed by everything it can do to take the time to learn it all. To make matters worse, most software cannot do everything we want or need it to do, so we end up purchasing other software to accomplish what the others can’t. All of a sudden, we are jumping around on too many different programs. When you create your own marketing technology stack, you don’t have to pay for technology that you aren’t using. By designing your own marketing technology stack, you can purchase only the tools you need, and you are more likely to be able to afford the higher-end tools because you aren’t paying for all that stuff that you aren’t using. Setting up a marketing technology stack has the potential to streamline your business and make your life easier. But it can also do the opposite if you defeat the purpose by adding too many different techs to the stack. 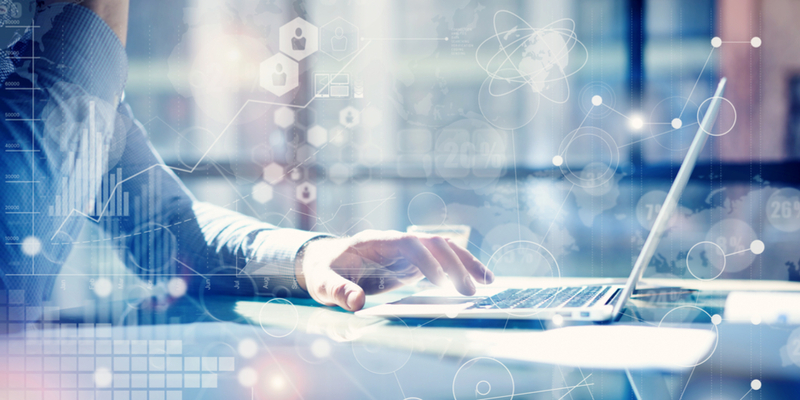 Overload and disorganization as a result of too many technologies are detrimental to a business, so make sure your marketing technology stack is optimized for efficiency and streamlined simplicity. NewsCred Insights advises that you have a solid CRM (customer relationship management) software in place before developing your marketing tech stack because it needs to integrate seamlessly with the stack. Work hand in hand with your IT department before putting any new technologies or systems in place. They will have suggestions you wouldn’t otherwise have thought of, and they will be able to provide insight into how the stack you set up can integrate and affect the rest of the company. The marketing technology stack that you can build obviously depends on what you can afford, so an important early step is to determine what that budget is. Then from there, you can narrow down your software and technology options. By starting with a framework for your marketing technology stack, you ensure that you are putting a strategy into place that will work for you for many years to come, even if the software in your stack changes. Plus, it’s what aligns your technology with your business goals. This is the step where you map out the different marketing categories you want to include in your stack, all designed around a streamlined flow of software. A visual diagram is the best way to build this framework. Once you have the above components in place, you can map out what software your tech stack should include. There are almost too many options when it comes to marketing tools for your tech stack. That’s why we like to look at some compiled lists so we can learn about each one at a glimpse and narrow down our choices quickly and easily. Here are 63 of the top marketing tools of 2018. Here are some lesser-known tools that you might consider for your marketing technology stack, many of which often have advantages over leading tools. Your marketing technology stack is the key to avoiding multisystem chaos, not to mention creating a flow of marketing technology that streamlines and simplifies your business, making it easier to accomplish your tasks and meet your goals. As a next step, we suggest meeting with the people in your organization who have any hand in marketing technology to get the ball rolling. Happy stacking!